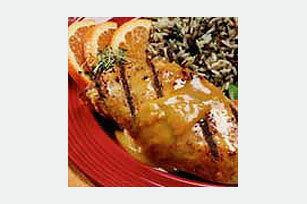 Before grilling, chicken is marinated in a tangy mixture of honey mustard, orange marmalade, gingerroot and garlic. Mix mustard, marmalade, ginger and garlic. Place chicken in glass dish or plastic bag. Pour 1/4 cup of the mustard mixture over chicken; turn to coat. Cover. Refrigerate at least 1 hour. Remove chicken from mustard mixture; discard mustard mixture. Grill or broil chicken 5 to 6 minutes on each side or until cooked through. Heat remaining mustard mixture. Serve over chicken. Substitute 2 tsp. ground ginger for 2 Tbsp. chopped fresh gingerroot.